The N4C mini-con is coming up on May 3-5, and will be held at a location in central Iowa that is only a short drive from the Pella Tulip Festival. Send in your registration by April 17. Panorama prints are one of the specialties that will be judged during the mini-con. Jennifer is on the ballot for a director position with N4C. This will be a one-year appointment. More info and a link to the mini-con registration form is on the N4C website. The Dubuque Audubon Society will sponsor its annual bird banding program at the Mines of Spain on Saturday, March 24 @1:00 p.m. If you love photographing birds, this event may offer you some photo opps. You will get an up-close view of chickadees and other birds that frequent the feeders near the nature center. The Dubuque Area Writers Guild is taking B&W photo submissions for its Gallery anthology. Several club members have had work included in the past. This year the subject matter is wide open. However, we do not have info about dimensions or filesize. It might be a good idea to team up with a writer in order to have your photos illustrate their work. Deadline is April Fool’s Day. Depending on the weather (and who knows about that lately?! ), the 2019 Galena St. Patrick’s Day parade may make a good photo opp. Not only are you likely to see leprechauns but also people wearing Civil War era costumes. The parade will be held on Sat. March 16 starting at 4:00 p.m. It is sponsored by the Galena Elks Lodge. 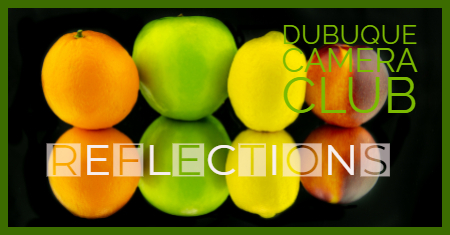 REFLECTIONS — Dubuque Camera Club photography exhibit at the Dubuque Museum of Art, Sept. 21 to Nov. 10, 2019. REFLECTIONS will be the theme of our 2019 exhibit at the Dubuque Museum of Art. The exhibit will be on display from September 21 through November 10, 2019. BE LOOKING AT YOUR PHOTOS FOR SUBMISSION IDEAS! Deadline to submit your images: June 3rd. Participation is limited to current club members. Initial image submissions will be due by our June 3rd picnic with the museum staff to make final selections. We plan to print on metal or on metallic paper. The club will offer a stipend toward the cost of prints. We may hold a workshop this summer to frame and mat our own prints. Exhibit committee: Robert Felderman, Pamela Brandt. More details will be announced at future meetings. About 40 people attended the sequel to Andreas Exner‘s Storytelling in Wildlife Photography presentation on Sunday, March 3rd. The program had been pushed back one week due to winter weather. Good job again, Andreas! Robert Felderman is going back to college in an online photography program at the Rocky Mountain College of Art and Design. His work was recently juried into the college’s annual student exhibition. Congratulations, General Bob! José Garcia had his photography noticed again on the official CanonUSA Instagram account. Congrats, José! David Smethers, First place, Digital Journalism. Two merit awards. Kevin McTague, Merit award, Honorable mention. Karen Johannessen Durrant, Merit award. Good job! We are very proud of everyone who entered! As the keynote discussion of the evening, club member José Garcia demonstrated the advantages of using a mirrorless camera. He owns a Canon EOS R. It is lightweight and comfortable, can use any Canon lense, and has an awesome focus assist and other features. For instance, with the touch-screen, adjustable LCD, you can use your finger to select the focus points and not take your eye away from the viewfinder. Meanwhile, in the viewfinder, what you see is what you get. There’s no “click” sound, which is convenient for church weddings (or wildlife). The camera’s low light focusing ability makes it “amazing for night photography,” said José. It’s got eye detection for portraits and a real-time histogram. When you change the lenses, a curtain closes so you don’t get dust inside the body of the camera. Every photographer at the meeting had a chance to take a closer look at Jose’s new Canon when he passed it around the room. It felt like passing the baby during a family gathering. However, the technobabble and photography jargon made it clear we were at a meeting of the Dubuque Camera Club. Thanks to José Garcia for sharing his expertise in this presentation! Here’s a 5-minute video from Sony that talks about the difference between DSLR and mirrorless cameras. March 18, 6:30 p.m. — Club meeting. “The Magic of the Histogram.” Free photography presentation by Henry Matthiessen. BRING YOUR FRIENDS! More info here. April 1, 6:30 p.m. — Club meeting. N4C submissions are due before the meeting. No DT submissions this month. May 3-5 — N4C mini-con at Wesley Woods, Indianola, IA. More info here. June 3rd, 6:00 p.m. — Annual picnic. Open to club members only. Last meeting of the regular N4C season. 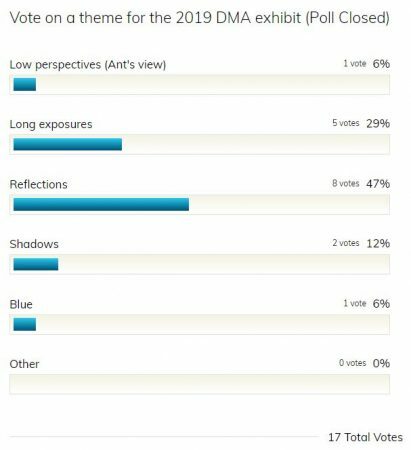 DMA “reflection” submissions are due. Because the club needs to decide on a theme for the upcoming 2019 Dubuque Camera Club exhibit at the Dubuque Museum of Art, club members were asked to vote in a poll. Information about the poll went out by email, and it was also discussed at the Feb. 18th meeting. Seventeen people chose between five options. The poll closed the day after the meeting. See below for the voting results. The club will make a final decision about the DMA exhibit theme at a future meeting. If you are a club member and wish to participate in the exhibit, please be aware that digital submissions will be due by our June 3rd picnic. After the museum makes selections, we will order prints (dimensions TBA). This year, the club will give participants a stipend toward the cost of prints. We will possibly frame and mat our own prints in a workshop this summer. The exhibit will be on display from September 21 through November 10, 2019. Seeing Red – Club members, submit your images! ONLY CLUB MEMBERS ARE ELIGIBLE TO SUBMIT: Club members may submit up to five images that contain the color “Red” in some shape or form. Send your images to Ron Tigges by email. Complete details, including file naming and file size were in the email that was sent out to club members on May 10. The size is tentatively 12-inches x 18-inches. Submissions will be placed in the club’s Smugmug gallery. SUBMISSION DEADLINE: Entries may be submitted until Monday, June 18, 2018. Printing costs will be paid by the artist. 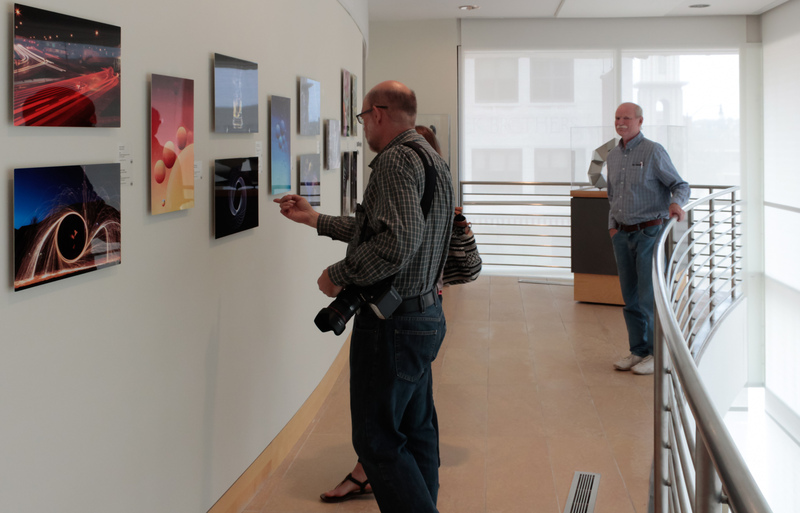 All prints will be returned to the photographers after the exhibit closes. We need all prints ready, with artist agreements signed by August 30. Contact Ron if you have any questions. 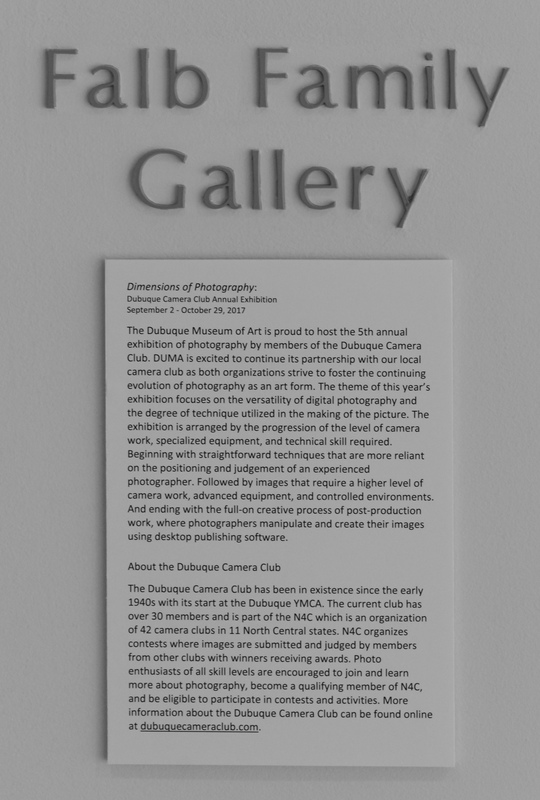 Remember, participating in club activities, exhibits, and events, is one of the perks of Dubuque Camera Club membership! Our club is made up of a terrific group of talented individual photographers. This is an opportunity to show and share your creative work! May 10: Call for images went out to members. June 18 (2 weeks after picnic): Deadline for members to submit images. July ?? : Selections made by museum staff. July 30: Send for printing. Cost per print $44.76. August 30: Prints ready, artists’ agreements signed. Sept. 4-12: Deliver prints to museum. Sept. 13-15: Exhibit opens during Blufftops & Visions convention. Friday, Oct. 5: Gallery reception during Fall Into Art. Nov. 6-9: Pick up prints. Monday, May 21 @ 6:30 p.m. – Regular club meeting. Monday, June 4 @ 6:00 p.m. – End of year Potluck Picnic. Tuesday, Sept. 4 @ 6:30 p.m. – First regular meeting of the upcoming season. September 13-14-15, 2018 (Thursday-Friday-Saturday) Blufftops & Visions N4C Photography Convention in Dubuque! Seventeen people attended the meeting on Sept. 18, 2017. 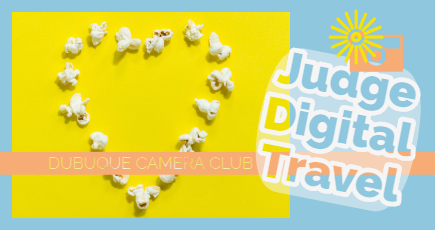 Our club judged 79 images in the Digital Travel category. Judges: Dave Smethers, John Leicht, and Kevin McTeague. Judging facilitators: Cara Pusateri, Pamela Brandt, Ron Tigges. At the start of the meeting, Jennifer Tigges gave an overview of the organizing that will need to go into the 2018 convention. She and Ron will be attending this year’s Presidents, Pixels & Pines event in South Dakota and taking notes. If anybody else is attending the event, please bring back ideas! Remember, everybody will have to pitch in to make the 2018 event next year a success. It will be headquartered at the downtown Dubuque Holiday Inn with many events within walking distance. The name of the event is Blufftops and Visions. Be sure to like the new Blufftops and Visions page on Facebook. The club meeting on Oct. 16 meeting will be a preliminary planning meeting. Think about potential partners, who you would like to see as a presenter, or what you would like to have as a workshop or field trip, and be ready to toss out ideas! If you want to see terrific examples of photography by club members, be sure to visit the Dubuque Museum of Art. 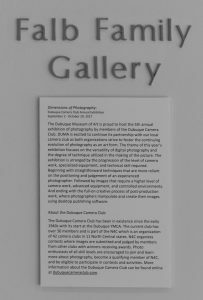 The Dimensions of Photography, an exhibit of photographs by the Dubuque Camera Club, will be on display in the upstairs balcony through October 29, 2017. Remember, all tri-state photography enthusiasts are invited to participate in the Dubuque Camera Club. Photography by the Dubuque Camera Club was featured in an exhibit at the Dubuque Museum of Art in Sept.-Oct. 2017.